I finally got around to tapping maple trees last weekend. The weather was great on Friday, and so-so since then, with some rain and snow. I’ve still managed to collect about 30 gallons of sap, and we’re looking to do a boil this weekend. I still have to build some sort of evaporator, but I think we’ll be alright. If the weather keeps up and the sap keeps flowing, maybe we’ll do more than one boil this year. Probably not more than two though – there’s lots of other stuff that needs to be done! To tap, you’ll need a few spouts (the part that actually gets tapped into the tree), a few buckets, and a drill. Drill holes (generally 5/16″ but may vary depending on your spouts) about 1/2 – 1″ into the south-facing side of the tree, then gently tap the spout in with a rubber mallet. If it’s a sunny day and you found a good tree, the sap should start dripping almost instantaneously. Hang the buckets, then let ’em drip, err, rip. 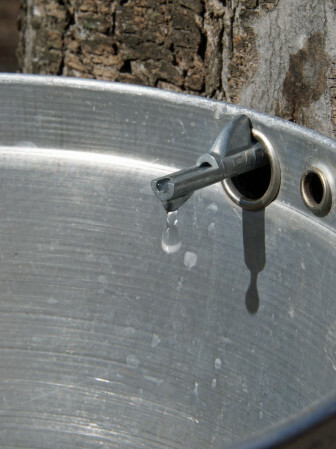 Depending on the size of the bucket and how the sap is flowing, you may need to empty them more than once a day! And if you’ve never done it, check out how to turn that sap into maple syrup!